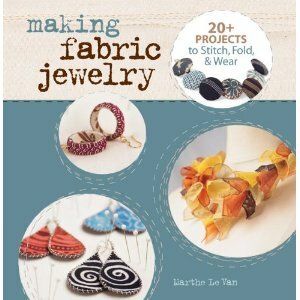 Making Fabric Jewelry was formerly published in hardcover format as Stitched Jewels, so it's possible you've already seen this book. If not, though, you're definitely going to want to give it a look if you enjoy incorporating fabric into your work. Twenty different designers contributed 23 projects that will stretch your preconceived ideas of how fabric can be used in jewelry. Yes, there are pieces that are sewn and stuffed, but that barely scratches the surface of the techniques that are used. Wrapping, gluing, fusing, shredding, stitching, tying, and transferring images...this book brings a full range of mixed media techniques to bear. Would you like to win a copy of Making Fabric Jewelry? Just leave me a comment below and you'll automatically be entered to win. If you tweet or post on Facebook or other social spots about the contest, you can leave a second comment and be entered twice! Sounds like an interesting book. Thanx for the chance to win. I tweeted about you book giveaway. This looks like a great book and I have tons of fabric scraps that I'd like to find ways to use up. Would love to win. Thanks. This sounds like a fun book with lots of techniques worth exploring and incorporating. I'd love to add it to my library! I'd love this book! Thank you! Im making Christmas this year and I would love to do this!!!! Interesting book. Would love to win it. I've made a few of the 'stuffed' variety, but I'd love to incorporate it in more ways. Thanks so much for the giveaway! I would love to explore this book! Thanks for the giveaway! Pretty please count me in! Looks like a great book with ideas that are new to me. Inspiration for my muse! Love your blog. I get it via email. I would love to add this book to my small library of jewelry books! Thank you so much for the giveaway! I,ve been wanting to learn how to make jewelry from fabric. This looks like a great book. Would love to win this book! Looks great! I wish this book. I belive that will gave me a lot new idea for use.